Lyonesse is a mythical land between Cornwall and the Scilly Isles that reputedly sank into the sea. 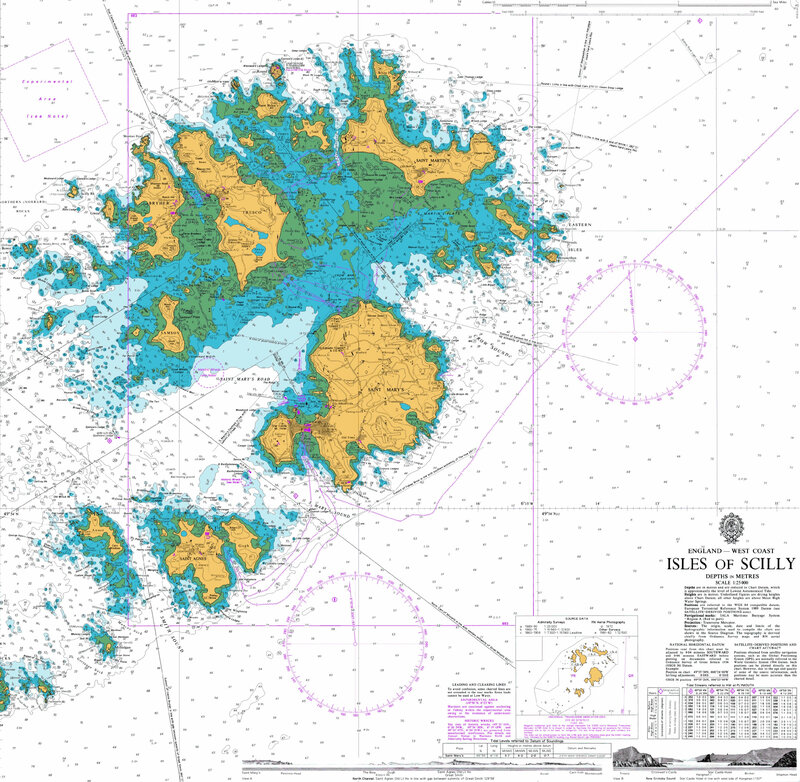 Ancient maps indicate that most of the Scillies were united in Roman times(a) noted by Peter Stanier in his book about the region. Legend has it that it contained 140 temples. Mordred, is said to have fought his final battle with King Arthur at Lyonesse. This ancient tale has been regularly linked with the destruction of Atlantis. There is a parallel Breton legend of Kêr-Is (Ker-Ys in French). A group of rocks called the “Seven Sisters” lies six miles (10 km) off Land’s End, the southernmost tip of Britain. According to legend, these rocks mark the site of a kingdom that once linked Britain to France. The site description fits in with the Cornish myth of the kingdom of Lyonesse – also known as the City of Lions. In the 5th century A.D., Lyonesse was inundated and disappeared beneath the sea. The legend has it that there was only one survivor. Since then, local fishers have caught pieces of buildings and other remains in their nets. They claim that these come from Lyonesse. Henry Beckles Willson in a 1902 booklet claimed that land now lost, once extended from Land’s End to the Scilly Isles. Contrast that with a speculative map in Lucile Taylor Hansen’s book The Ancient Atlantic, which shows Lyonesse as a large landmass west of the Scillies. She also informed us that the island of Tresco, which today is roughly 2 miles long and a mile across at its widest, had a circumference of ten miles in 1538. A team of Russian scientists were hoping to answer the two and a half thousand-year-old mystery regarding Plato’s Atlantis, with an investigation of the underwater ‘Celtic Shelf’ beyond the Scilly Isles. Viatcheslav Koudriavtsev, of the Moscow Institute of Meta-history, has used a re-interpretation of the classical Greek texts to locate the possible position of the fabled ancient lands. It is claimed that in the 1990’s the British authorities were set to issue a six-week licence for the exploration of Little Sole Bank, a conical submerged hill lying only 50m below the surface approximately 100 miles south-west of the mainland, but apparently due to a lack of funding nothing has been heard of the project since. In 2012 the ‘micronation’ selfstyled as the Principality of Lyonesse declared its ‘independence’(b)(c).